Most other sensible people would have sent this horse packing long ago - if not to the knackers. In the beginning, Banderaz LC10 (aka "Titan") caused a serious wreck with Diane. Her husband John told her to get rid of the horse. Friends told her she was crazy to keep him. Banderaz was a free horse for the Stevens, back in 2006 as an untrained 4-year-old, from RheaNell Roberts. "He was supposed to be John's horse, but he was in the Navy, and had back issues. John did a few training rides with me but his back really bothered him. He didn't enjoy it." Diane hadn't gotten on Banderaz more than a few times before he went up and over on her, shattering her collarbone into seven pieces. She can still show you the protruding edge of a metal plate. John told her to get rid of the horse before he came home from his tour in Iraq. But, dangerous as she knew he was, Diane just could not let the horse go. She sent him to two trainers, with inadequate results. It was the third trainer, Jessica Goheen, who discovered the key to bringing Banderaz around. "He'd never had foundation work of someone showing him 'You're looking at #1, YOU are #2," Diane recalled. first ride on him - right after her shoulder had healed up - was at once "terrifying and amazing." Banderaz never put a foot wrong, and he just wanted to go and go. And once Diane was able to let go and decide to trust in him and give him a loose rein, the magical partnership had already begun. That's when Titan earned his nickname, "because it was a new beginning for him," Diane said. "It wasn't one thing that made me keep him. It was more a feeling I had about him that he had greatness inside him." It was actually Goheen that planted the Tevis idea in Diane's head. "On my last ride with Jessica I told her about my dream of one day doing Tevis. I was very surprised when she looked at me and said, 'Titan is your Tevis horse.'" Shortly after turning Titan back over to Diane, Goheen was tragically killed in a car accident. She was only 23. "She’s a big part of why I didn’t let my fear win. Also why I’ve turned down every offer to sell Titan." That greatness Diane felt about her horse was in evidence on July 29th, when Banderaz LC10 and Diane Stevens crossed the finish line of the Tevis Cup at 11:49 PM, in 6th place, for their fifth Tevis Cup completion. "It’s always amazing to take that victory lap on a horse that you have ridden for years and worked hard to manage. Titan felt alert and strong. His level of strength throughout the day really kept my energy high," she wrote afterwards. The 2018 Tevis Cup was 16-year-old Titan's 11th 100-mile completion. Over 10 endurance seasons, the gelding by Jazzman DGL x Zordosa, by *Bandos PASB now has 2890 miles, 49 of 54 completions, and 8 Best Conditions. But the broken human bones, the healing, the trust and partnership, the successful ongoing endurance career, and the five Tevis buckles are only part of the story. In July of 2015, Titan almost killed himself. He'd somehow impaled his groin on a metal T-post in his pasture, and when veterinarian Karen Hassan arrived, she confirmed it was very bad. "She told me she might not be able to save him," Diane recalled, "that I probably wouldn't be able to ride him again, and of course I wouldn't do endurance. I said 'I want you to save him.'" It was almost as if the horse willed himself to get better. 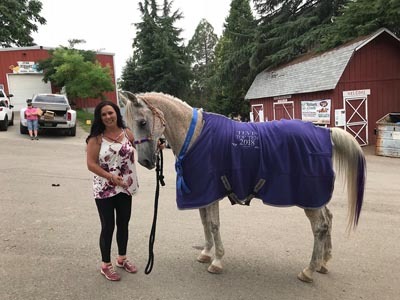 Within 3 weeks he'd shown "amazing healing," so much that Diane told her husband that she thought Titan had a shot at coming back to endurance. And eventually, he came back, and in a big way. Diane pulled him as a rider option in his first post-accident ride, a 55-miler in November of that year, but only because Diane forgot her half chaps and rubbed her knees bloody, and she didn’t want to risk making him work too hard because she wasn’t riding balanced. But since then Titan has competed for 3 more (ongoing) seasons, with 15 completions in 17 starts, which includes 5 first-place finishes and 3 second-place finishes in 50- and 100-mile rides, and 2 top-Tens in the Tevis Cup - last year (10th place) and this year. "My husband says, 'One thing for sure, when you talk about you and Titan, you don't give up and that horse doesn't give up.' Every ride that I do on Titan and he finishes, it feels like a gift. "This horse has continued to amaze me. He's pretty incredible. He really is a Titan!!"